One look at a woven bag from AAKS will have any fashionable gal swooning. Carefully handcrafted in vibrant hues, each piece from the Ghanaian accessories line is designed with the venturesome woman in mind. Even better, the 3-year old brand follows in a recent tradition of diaspora fashion labels supporting ethical endeavors (see: Brother Vellies, Byas & Leon) in their supply chains, allowing the end-consumer to invest in jobs for the craftsman class. AAKS showcased its Autumn/Winter 2017 collection at the inaugural A/W Lagos Fashion & Design Week this March and opted for cooler tones in its assortment of bucket bags, pouch clutches, and oversized totes detailed with leather tassels and fringe overlays. 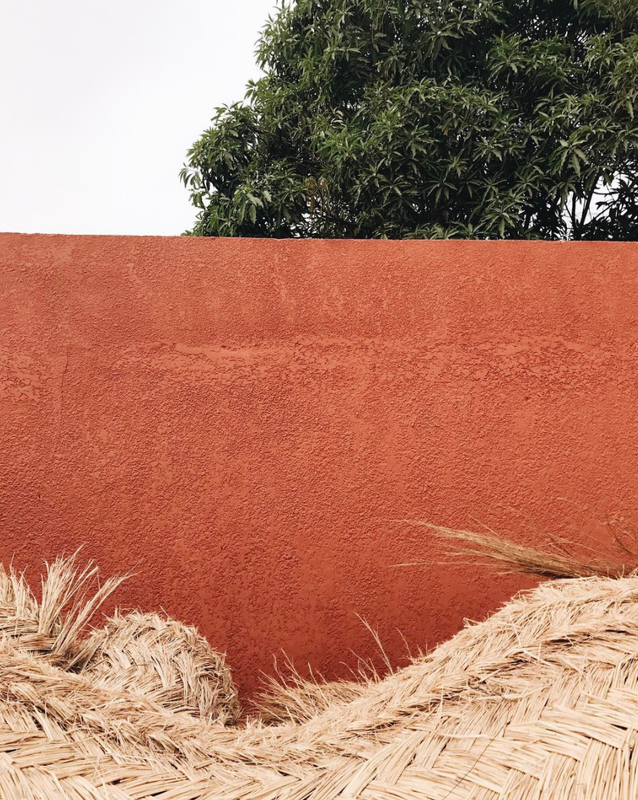 We connected with AAKS founder and creative director Akosua Afriyie-Kumi to learn more about her latest collection, why she announced a partnership with UNHCR Refugee Artisan Project, and what's next for the vacation-chic brand. PROTOChic: What inspired the conception of the AAKS A/W 17 Collection? Akosua Afriyie-Kumi: I seek inspiration by visiting my favorite places and exploring new environments through travel. I am an avid sunset photographer, so I normally pick beautiful hues from pictures I have taken from travels, which then form part of my color palette. PC: In your design process, where do you begin - with the vision, the materials of interest, or the process with your studio team? AAK: My design process is slightly complex, but simple at the same time. I start by establishing a mood that fits with my client's lifestyle and my design aesthetic. I draw my bag designs from photographs, historical and contemporary fine art, and fashion photography as well as from architecture. After drawing and deciding on a set of ideas, I take my design sheets with spec measurements, color ways, and finishes to my weavers where I brief them about my inspirations and ideas for the season. Weavers also bring on board their ideas of technical knowledge for how each bag will be executed. We then begin by twisting raffia, which is the main material of our bags, and dying the raffia strands with organic dyes before allowing them to dry in the open air. Preparation normally takes 3 - 4 weeks before weaving can begin. PC: In such a highly collaborative partnership, how do you transform the raw materials into the final handcrafted bag? AAK: Weavers then start making 3 dimensional shapes of my designs with critical attention to detail and we achieve sample shapes for the season. I bring the samples to my studio 10 - 12 hours drive away from the weaving community and start putting together finishing touches such as linings, trims, labels, leather handles and buckles. I go through each piece to approve quality and I pick the final pieces, which are then presented as my seasonal collection for the customer and delivered to stores. PC: Your most recent collection marked the debut of the Belle Hori bag defined by its deeper color palette. What defines this product and differentiates it from the iconic bold and bright collectible pieces AAKS is known for? AAK: I created the Belle Hori bag and the broader AW17 Collection because I wanted to showcase the craftsmanship in much darker tones while still keeping hints of bright colors. In fact, I had the pleasure of showcasing this collection as part of a trade show in Paris - Maison et Objet, whereby the theme required me to work within a cool toned palette. It pushed my boundaries as a designer. I loved it as I never thought I could go dark! PC: AAKS recently announced a partnership with the UNHCR Refugee Artisan Project. What sparked the collaboration and how do you intend to continue moving forward? AAK: The collaboration was sparked mutually. The UNHCR saw the work I was doing in Ghana in the weaving communities and had already started an artisanal project in Burkina Faso two years prior. They were on a look out for a designer with the relevant skill set from Africa that they could partner with in supporting refugee women to create a home interior product line that could be sold internationally and bring continuous work for the women in the camps. The collaboration couldn't have come at a more perfect time as I had dreams of developing a home interior collection within my business. With this partnership, it allows me to explore new areas of my work, but also most importantly build capacity with a new group of weavers in another country. PC: Lastly, AAKS has achieved a number of milestones many Africa-based fashion brands are working to accomplish, including global distribution with large players such as Urban Outfitters and Anthropologie, concept stores such as United Arrows in Japan, and your own direct-to- consumer site. What is next on the horizon? AAK: Thank you! Our marketing plan has always been the same from Day 1. I knew how powerful social media was and still is and I maximized it to my best advantage when I launched AAKS. I took colorful pictures of the behind-the-scenes process with my weavers and traveled to remote areas of Ghana, which at the time many brands were not sharing with the world. This is a key area of my business that I feel brought a lot of interest and a unique audience who cared about where and who was making their bags. What's next is to continue telling a beautiful story of my work and of Africa as a whole.